It’s great to be in love with someone who treats you like you are his Orion in the night sky, and you feel like expressing your love by writing I love quotes for him. When we first fall for that someone special, we might have that feeling of cute little butterflies dancing salsa in your heart is worth a million dollars. Culturally and historically women are used to get all the attention from the opposite gender as far as love and courtship is concerned. What most of us forget is that men too are emotional creatures and a little bit of appreciation can also make their heart melt. The true feelings of an honest heart is the rarest treasure which a women can give to her man. Don’t worry too much about the words and sentences, simply let your heart out and pour your sacred feelings on a piece of paper. If you are not good with words or want to express your feelings in a more idyllic way here are some love quotes for him which can help you. Waiting for you is as delightful as waiting for sunset. You picked up every broken pieces of my heart. You promised me you will never make me cry. Because of you, I learned how to trust again. Loving you is not a choice or an option. It is a need and a necessity. I’m a winner because I always bet on you. Like a child who saves their favorite food on the plate for last, I try to save all thoughts of you for the end of the day so I can dream with the taste of you on my tongue. You are my favourite part of life. More of The Best inspirational Love Quotes. Our lives are like a romantic movie played again and again. We smile, we flirt, we laugh and we fight – and we do it all over again. Your love is sweeter than chocolate, more intoxicating than wine and feels warmer than a fireplace in winter. In short, your love is magical. If loving you was a job, I would be the most deserving, dedicated and qualified candidate. In fact, I would even be willing to work for free. Lets grow old and miserable together. I love you more than pizza. You are the Na+ to my Cl-. I love you a lottle. It’s like a little, but a lot. You’re just like chocolate — you make everything better. Moderation in everything is my goal, except for one thing: you. I want you to surround me with your love and hold me forever. It may be excessive, but I want it so terribly. I never finish falling in love with you. I always hear people asking God for a chance to do things over. It confused me until I realized that they must not have found a soulmate like you. For you did not whisper into my ear; you spoke to my heart. You kissed not my lips, but my soul. If you have any suggestions for Love Quotes for Him, please let us know on the Contact page. Thanks. 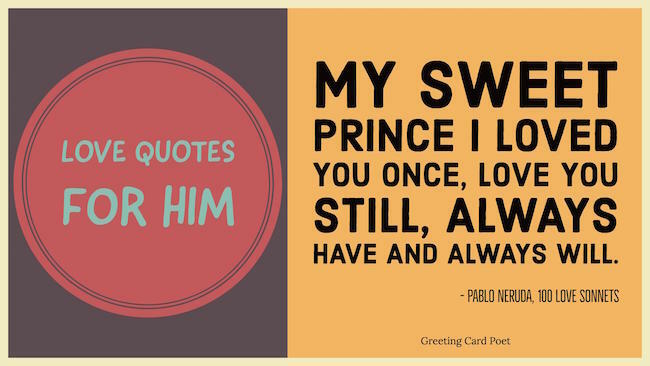 You’re on the Love Quotes for Him page.